The Testament of Job is a dividing line between two interpretational systems. The traditional one, which was held by Catholicism and Protestants until the 1800s, holds little value to the Testament of Job or anything understood as angelic tongues. The understanding of the christian doctrine of tongues was either miraculously speaking or hearing a foreign language during this period. The modern definition is a different approach. The Higher Criticism glossolalic doctrine of tongues provides an answer through the Delphi prophetesses in Greek history and then winds its way to Pentecost, Corinth, and then Montanism. The concept of glossolalia in this stream of thought is “utterances approximating words and speech, usually produced during states of intense religious experience.”1 It is not considered miraculous but a psychological condition. The connection with the Testament of Job is through this framework. It does not flow through the traditional one. Two academics from the Pentecostal viewpoint, Gordon D. Fee and especially Russell P. Spittler, modified the Higher Criticism analysis with the Testimony of Job to prove that the Christian rite of tongues as an angelic, non-human language. Consequently, it gives historical validity to the present Pentecostal doctrine of tongues. The Pentecostal doctrine of tongues as an angelic language is on the quiet underside of the Pentecostal experience. A personal prayer language that is known only between the person and God, or a supernatural language of praise and worship, are more frequent renderings. How this angelic tongue concept first originated in Pentecostal circles, it is not known. One must keep in mind that a casual reading of the Bible combined with a sense of mysticism could easily create such a sense in any epoch of Christianity. What is the Testament of Job? The plot of the Testament of Job is a 100 BC modification of the popular and old Book of Job found in the Bible. This retelling is different and adds new twists and turns. The focus of this study about Job’s last words to his seven sons and three daughters. Job bestows his physical assets to his sons and a supernatural gift for his daughters; three heavenly made sashes that when worn, cause his daughters to enter a different mental state where eternal ones replace the present realities. It also causes them to sing exalted hymns in the dialect of certain angels. It is hard to distinguish whether the Greek or Jewish influences dominate this book. This complexity has vexed many academics and remains a question unsolved. An article posted on the web attributed to Michael A. Knibb and Pieter W. van der Horst, editors, Studies on the Testament of Job gives a good outline of the whole work. . . .Paul was referring to angelic or heavenly languages or at least that this is what the Corinthians themselves thought, where some are not prepared to offer their own views. Fee cites Russell D. Spittler’s translation as found in the book, Old Testament Pseudepigrapha to build his thesis and rests solely on this reference. He does not substantiate his claims with any other source. Spittler himself, a Harvard graduate, and now retired professor from Fuller Seminary, is also from a Pentecostal background and affiliation.7 He mixes both Higher Criticism and Pentecostal influences in his translation. This combination is not unusual nor surprising. This relationship has existed for almost a hundred years and substantiated in a previous series on Pentecostal tongues and Higher Criticism. Unfortunately, Spittler, and then Fee who follows his line of thought, do not accurately translate Greek to make their case. The best argument that these two can make is that that the persons allegedly speaking in the languages of angels were speaking and articulating in highly exalted hymns—ones that the brother of Job claimed to have recorded in writing and left for posterity. This type of inspiration was not unusual with Greek prophecy. Articulation of hymns and poetry was the common delivery method of visions and ecstasy for the Delphi prophetesses in ancient Greece. Their prophecies, initially induced by the volcanic fumes emitting from cracks in the chamber, could change the destiny of wars and whatever question, small or great, seekers came for. Read the Delphi Prophetesses and Christian Tongues for more information. It also is very simplistic to try and build a case for angelic tongues on three paragraphs of intertestamental fiction. It was never meant to be a didactic piece. One has to ignore over a thousand years of Christian and Jewish literature that relates to the tongue genre to make this case plausible.8 Indeed, the text itself, if read with serious intent, leads to a highly exalted state of praise, resulting in the production of extraordinary hymns/poems that is above regular human capacity. It has little to do with a strange or exotic language. The above statements should suffice as a complete argument, but for the sake of thoroughness, here are the source details along with some commentary. The Greek text is fairly straightforward. It is the English translations where one begins to see major differences and interpretations. This article follows the numbering system displayed by the Online Critical Pseudepigrapha, and also followed by the book, Old Testament Pseudepigrapha. The headers 45 to 53 are the ones under evaluation, and 48 to 50 specifically refer to angelic tongues. The first translation is from the Old Testament Pseudepigrapha (1983). Russel P. Spittler is the translator. I have highlighted the important passages in red. 48:1 Thus, when the one called Hermera arose, she wrapped around her own string just as her father said. 2 And she took on another heart—no longer minded toward (Pg. 866) earthly things— 3 but she spoke ecstatically in the angelic dialect, sending up a hymn to God in accord with the hymnic style of the angels. And as she spoke ecstatically, she allowed “The Spirit” to be inscribed on her garment. M. R. James is the first one to pen a popular English translation of Testament of Job back in the late 1800s. It is a dated read with some awkward translation solutions. There are significant differences between his and Spittler’s translation. In the bigger picture, Spittler’s translation is the preferred choice, but when it comes to the angelic speech sequences, James’ older translation is the more literal and avoids the word ecstatically which does not exist in the Greek. He goes by a different numbering and chapter system that is not used in the Testament of Job editions today. 27 Then did the other daughter by the name of Amalthea’s Horn (Keren Happukh) gird herself and her mouth spoke in the language of those on high; for her heart was transformed, being lifted above the worldly things. I have highlighted in red the words and phrases that match the above. 48 1 οὕτως ἀναστᾶσα * ἡ μία * * * ἡ καλουμένη * Ἡμέρα περιείληξεν τὴν ἑαυτῆς σπάρτην * καθὼς εἶπεν ὁ πατήρ * · 2 καὶ ἀνέλαβεν ἄλλην καρδίαν, * μηκέτι τὰ τῆς γῆς φρονεῖν · 3 ἀπεφθέγξατο δὲ τῇ ἀγγελικῇ διαλέκτῳ * *, ὕμνον ἀναπέμψασα τῷ θεῷ κατὰ τὴν τῶν ἀγγέλων ὑμνολογίαν · καὶ * τοὺς ὕμνους οὓς ἀπεφθέγξατο * * εἴασεν τὸ πνεῦμα ἐν στολῇ τῇ ἑαυτῆς ἐγκεχαραγμένους. 49 1 Καὶ τότε * ἡ Κασία περιεζώσατο καὶ ἔσχεν τὴν καρδίαν ἀλλοιωθεῖσαν ὡς μηκέτι ἐνθυμεῖσθαι τὰ κοσμικά · 2 καὶ τὸ μὲν στόμα αὐτῆς ἀνέλαβεν τὴν διάλεκτον τῶν ἀρχῶν, * ἐδοξολόγησεν δὲ τοῦ ὑψηλοῦ τόπου τὸ ποίημα. * 3 διότι εἴ τις βούλεται γνῶναι τὸ ποίημα τῶν οὐρανῶν , δυνησητε εὑρεῖν ἐν τοῖς ὕμνοις Κασίας. 50 1 Καὶ τότε περιεζώσατο καὶ ἡ ἄλλη ἡ καλουμένη Ἀμαλθείας κέρας· καὶ ἔσχεν τὸ στόμα ἀποφθεγγόμενον ἐν τῇ διαλέκτῳ τῶν ἐν ὕψει , 2 ἐπεὶ καὶ αὐτῆς ἡ καρδία ἠλλοιοῦτο ἀφισταμένη ἀπὸ τῶν κοσμικῶν· λελάληκεν γὰρ ἐν τῇ διαλέκτῳ * τῶν * Χερουβὶμ δοξολογοῦσα τὸν δεσπότην τῶν ἀρετῶν ἐνδειξαμένη τὴν δόξαν αὐτῶν · 3 καὶ ὁ βουλόμενος λοιπὸν * ἴχνος ἡμέρας καταλαβεῖν τῆς πατρικῆς δόξης * εὑρήσει ἀναγεγραμμένα ἐν ταῖς εὐχαῖς τῆς Ἀμαλθείας κέρας. 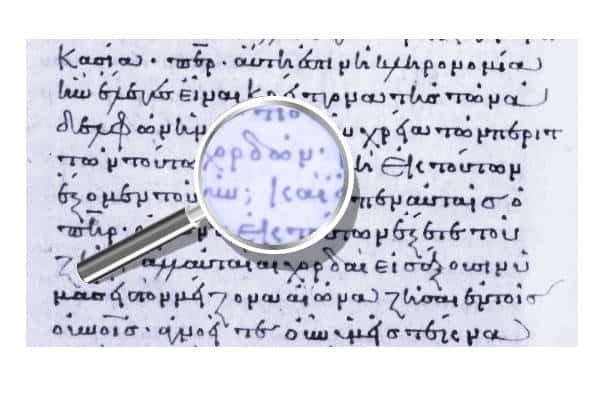 The transcribed text from the original Greek minuscule is found at The Online Critical Pseudepigrapha. It is an excellent site that has manuscript variances noted as hyperlinks. The level of reading difficulty is not hard to adapt for those with New Testament Greek skills. 48a The accounts of the daughters putting on their sashes (48-50) show several common elements: (1) the name of the daughter; (2) donning the sash; (3) having the “heart changed”; (4) no longer concerned with worldly things; (5) glossolalia in the language of specified human beings; (6) a brief characterization of the contents of glossolalia; and (7) reported preservation of the speeches in mythical books (but see n. H to 48). 48d V heightens by adding “and at once she was outside her own flesh,” which parallels Paul’s ecstatic ascent; he twice wondered whether the ascent was “in the body” or “outside the body” (2Cor 12:2ff.). The changed “heart” (cf. 49:1; 50:2) refers not to conversion but appears rather to describe the onset of the ecstatic state, “the descent to the Merkabah.” When Saul was “also among the prophets,” it is said that “God gave him another heart.” Note the similarity to the language of Montanus preserved in the 4th-cent. Heresiologist Epiphanius: “Behold! Humankind is like a harp, and I a strum as a plectrum; humans sleep, I am awake. Behold! The Lord is the one who excites the hearts of humans, the one who gives them a heart” (AdvHaer 48.4.1). Spittler’s introduction proceeds to make a solid connection between the Tongues of the Testament of Job and that of the Montanists in the second century AD. He thinks a portion of the Testament of Job, the piece we are looking at here, was a later emendation and insertion by the Montanists. He also alternatively speculated that these last parts of the Testament of Job may have been added by the Therapeutae–a first-century Jewish group described by Philo of Alexandria who had similar structures and beliefs to those of the Qumran communities. The Montanist argument and their association with the christian doctrine of tongues is a dubious assertion. They are but a small, speculative drop in a much larger dynamic of church history. The emphasis of Montanist influence can only occur with the de-emphasis and purposeful ignoring of major ecclesiastical texts addressing the christian doctrine of tongues. The use of the word dialect—διάλεκτος is a key term in this whole document. One of my first concerns in studying this word is our immediate perception of it to mean regional or geographical variations of a parent language. This assumption may not be the case. This word along with apotheggomai–ἀποφθέγγομαι to utter, or sound forth, or speak one’s opinion plainly, are both parts of the Pentecostal narrative found in Acts chapter 2. Although the sequence of words is similar between the two documents, 130 years separated their origin and written in different geographic regions. Dialect—διάλεκτος and even apotheggomai–ἀποφθέγγομαι may not share the same meaning between the Book of Acts and the Testament of Job. After looking at διάλεκτος for some time, the emphasis is not on dialect but on language. Διάλεκτος and the Greek word for language, glossa, γλῶσσα, can overlap in meaning. Perhaps, the use of διάλεκτος is to emphasize the peculiarity or specialness of the situation. The application of dialektos to the Testament of Job text is that the three daughters were speaking in a human language that was highly exalted and structured praise, something so well presented that it appeared to be of angelic origin. The emphasis on the word hymns in the actual Greek text is dominant in the angelic interplay. If this passage is understood correctly, which some dispute the literal meaning and see a more political undertone, then Jewish thought, or some sects of Judaism, understood angels with linguistic limitations based on human language, geography, and politics. The description of daughters speaking in the dialect of archons or cherubim is not surprising. The Qumran communities exhibit a full hierarchy of angels and a form of worship that integrates both angels and humans. The hierarchy listed by the narrator in Testament of Job is a trope—a figure of speech emphasizing how the praise was incrementally getting stronger and more impactful. Spittler has some validity from this text to prove angelic tongues but the overwhelming evidence shown throughout this article weakens his assertion. The writer of the Testament of Job is drawing from the ancient Book of Job and spicing it up with some Hellenistic drama with a mixture of Jewish thought. The person is integrating the ancient rites of the Greek prophetesses going into ecstasy resulting in uttering apocalyptic, prophetic, and supernatural directives spoken in hexamic poetry. The story also weaves into the narrative the growing awareness in Jewish circles the presence of angels and their heirarchy, especially in the presence of worship, enabling participants to enter into a higher state of worship, a place reserved for angels and the heavenly places. The text itself states that these daughters who spoke in the dialect of angels expressed it in hymns, and in one instance a poem, which the story narrates were written down for posterity sake. Spittler’s translation is not faithful to the text; the word ecstatically does not exist in the Greek. He is forcing the reader to believe in his viewpoint and Fee, not looking at the actual Greek, promotes Spittler’s translation and analysis. It becomes a cornerstone of Fee’s widely influential systematic Pentecostal theology on the tongues of Corinth. It is an assertion based on one text without reference or even wrestling with the tensions and contradictions with the many and important mainline Christian texts on the subject. There is no connection between this document and the Montanists. It is a document firmly rooted in the Hellenistic Jewish thought and practice that surrounds the first century. Read the article, History of Glossolalia: Patristic Citation for more information. A chat on Assembly of God Tongues Oct. 1, 2016. by Biblicist—Full Gospel Believer. A small Spittler bio. This bio is the best I can find so far. As far as I know, he is no longer actively teaching or serving at Fuller Theological Seminary. Numbers added here in the text by me. These were not part of the original copy. Thank you heartily for this latest addition to your corpus in the Gift of Tongues Project, touching on the “tongues of angels,” and the text of the Testament of Job and its presumed connections to Delphic, Montanist, and later Pentecostal and charismatic understandings of “tongues,” particularly as discussed in the influential works by Fee and Spittler. Brick-by-brick, your are building a formidable edifice of evidence for disabusing readers of tendentious modern and contemporary distortions stemming from insufficient awareness of the historical record.